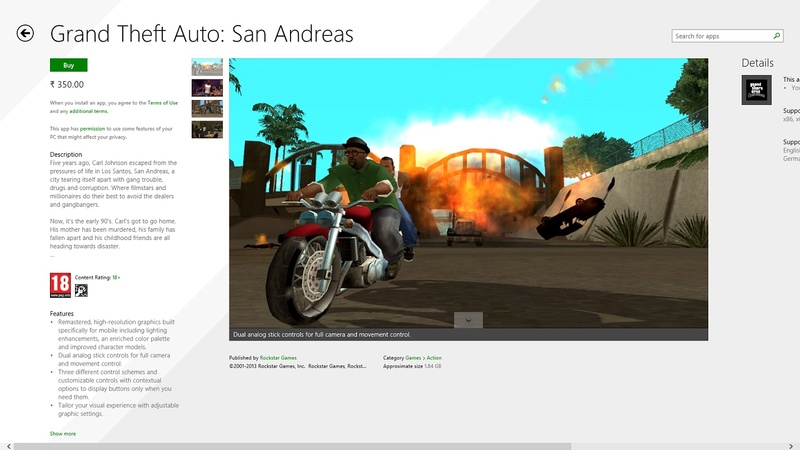 GTA San Andreas, one of the most successful title for Rockstar previously landed on Windows Phone. Now it's time for the WP's elder brother,Windows 8 to get the game in it's Store. Rockstar Games have managed to bring the full game with the complete storyline into a Windows Store app which costs ₹350 here in India and $6.99 in US. Though there is no trial version for the app, the game itself says the reason. The game has been played by millions of users already and does not need any introduction to the game. The app is big, really big weighing around 1.8 GB. Again the game is a big one which includes complex graphics for a app. Of course, the game has been optimized to work great with touch and also in PC's without touch.Enjoy the game ! FeaturesRemastered, high-resolution graphics built specifically for mobile including lighting enhancements, an enriched color palette and improved character models.Dual analog stick controls for full camera and movement control.Three different control schemes and customizable controls with contextual options to display buttons only when you need them.Tailor your visual experience with adjustable graphic settings.